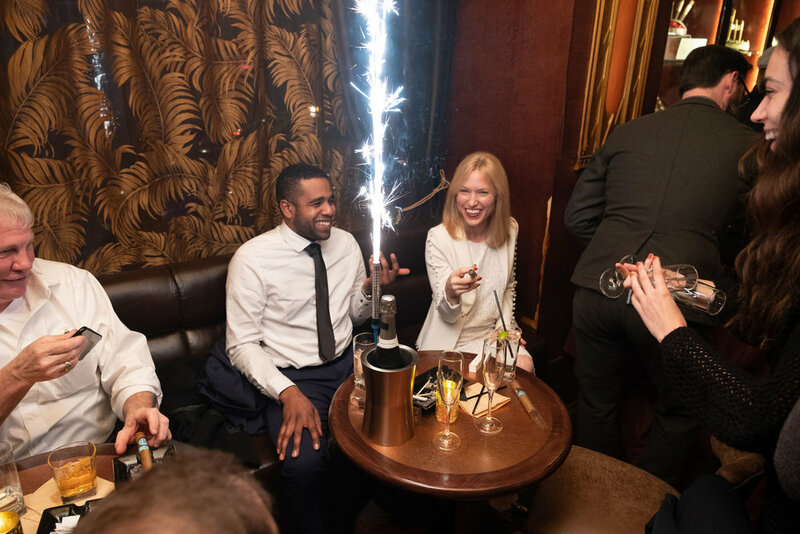 On Wednesday, January 16th, Soho Cigar Bar celebrated its 20th Anniversary in NYC. The hotspot is one of New York’s oldest cigar bars and lounges, which was formerly known as Circa Tabac. Walking into the bar is like stepping back in time, all the while enjoying a true New York City experience where you can indulge in the finest cigars, classic cocktails, rare whiskeys, delicious food and top-notch service. Owner Lee Ringelheim and GM Michael Dounoulis, who is the only certified Cigar Sommelier in the state, welcomed over 150 guests over the course of the evening. Hudson Whiskey Old Fashioneds were poured as guests circulated the bar, getting to see how cigars are made along the way. Every person in there made the spot feel cozy and at home. One drink turned into 3 (or 6?). People had an amazing and relaxing time. Mike, GM, is great at making his costumers feel welcome. The warm and welcoming environment of Soho Cigar Bar is reminiscent of a 1920's speakeasy with plush leather furnishings and art deco inspired décor. Modern touches include a state-of-the-art ventilation system and flat screen TVs throughout, discreetly hidden behind timeless art photography. Partygoers walked away with a gift bag filled with Soho Cigar Bar merchandise, ranging from ash trays and cutters, to commemorative lighters, in addition to Tullamore Dew Irish whiskey shot glasses, Balvenie Doublewood 12-Year-Old Scotch Whisky, Frey freshener, a Madame Paulette stain removal kit and a copy of the newest issue of Cigar Aficionado magazine. Soho Cigar Bar is open to the public 7 days a week beginning at 12pm. For more information or to make reservations, please visit, http://www.sohocigarbar.com.